From 3:30 to 5:00 every afternoon, we watched our beloved Stooges with prepubescent glee and as we had seen so many reruns, we would be a chorus of drunken finance and accounting majors reciting the now-legendary "Slowly I turn, step by step, inch by inch…" after which Moe beats the living crap out of Curly and Larry to which we are all in total hysterics. I swear that if anyone had recorded those episodes, they could extract a six-figure ransom for them happily paid by more than a few senior execs roaming around the country. Anyway, this one April Fools' Day (1976), a few of my fellow seniors decided that because a) we were all well on our way to graduating and b) for some (well, most), the ascensions to the pinnacle of their hockey careers had ended. I was on my way to the Saint Louis Blues training camp the following September but the rest of my buddies were not so fortunate. Drowning the sorrow of athletic disappointment, they proceeded to over imbibe with great gusto and energized enthusiasm to the point where, nearing the end of the night, it was apparent that I was not included in this "wake" for dead hockey careers because "YOU got a FUTURE playin' the game…" to which I responded (with incredible clairvoyance, I might add) "I MIGHT have a FUTURE in the game, boys! I just might!" Had I added "…for another couple of years," I would have been exaggerating. However, I digress. Across from Friday's was a non-sports bar called "Free Advice" and while it had capacity seating of perhaps 50 people, it had the distinct aroma of incense and weed wafting throughout the room while the patrons were staring, slack-jawed and emotionless, at the ceiling. These inoffensive souls would never be found, even in disguise, at Friday's; they detested sports and conservatism and ANYTHING vaguely resembling the American "Right." I loved that bar because you could go in and have a "bottled beer only" and a conversation with someone and listen to Pink Floyd rather than Bad Company, but most importantly, you could disappear in there. No reporters and no rat-fink classmates and most certainly no south Saint Louis rednecks looking to "straighten up wunnadem Canuck hockey dudes" such that I could depart the role of the "College Athlete" and assume the role of "Inquisitive Student," and while I was always welcomed by the regulars at Free Advice, I was never forced to watch the Stooges and back then, for me, THAT was IMPORTANT. On the night of April 1, 1976, my friend and teammate, Kevin Healey, of Don Mills, Ontario, Canada, and a member of the 1971–1972 Metro Junior B All Star team (that included such notables as NHL veteran coach Bruce Boudreau and 10-year veteran Larry Patey, as well as your author) proceeded to stumble home at some hour after they locked the doors and, after pausing in the dorm parking lot to "reflect," decided that we had to leave our "mark" upon that venerable Jesuit institution by way of adjusting the telephone poles that were situated along the 200-year-old cobblestoned alley that served the rear entrance of Griesedeck. My buddy "Heals" was 5'10" but weighed 225 lb and before we were teammates, he was a defenseman for the Markham Waxers of the old Toronto Metro Junior B League, and I can tell you that he was one of the strongest players I ever encountered. So, when an extremely intoxicated and mildly stoned person of that disposition grabs a support coil for a telephone pole and starts to PULL on it, one might expect a reaction. Well, the reaction was, as expected, unique because, just as the competitive juices are unleashed on the ice, I rose to the calling while throwing all sanity and common sense to the wind and grabbed that same coil and together, "Heals" and I watched with delight as the pole began wobbling and the electrical and telephone wires began playing "skip rope" and then without warning and to our simultaneous delight and horror, those big junction boxes started to go "Boom! Boom! Boom" down the laneway, sparks flying everywhere and suddenly, the entire campus went totally dark. Completely and totally dark. The campus stayed dark for two days as the university security personnel investigated the cause but since the poles never went down, they remained aloft and there never existed to this day any evidence that explained the blackout. That was April Fools' Day 1976, aptly named and fondly remembered. Years later, after I had lost touch with Kev, I learned through his bother-in-law, whose family owned the cottage that I bought on lovely Lake Rosseau in 1996, that Kev had contracted a debilitating disease called "MS" or "Multiple Sclerosis" but that he was staying at his mother's cottage on the other side of the lake. After getting his phone number, I rang him up and invited him to join me for lunch at the Lake Joseph Club. I can't tell you how much it meant to him as he had to struggle down the wobbling little dock they had as I moored up in my 1995 Cobalt and helped him into the boat, I saw the terror in his eyes, in that I might feel uncomfortable with him in such a sorry state. Far from that, I gave him a big hug and then slowly motored over to the Club, docked, and then helped him navigate from the boat to the bar, situated next to Martin Short, with whom he chatted, and then had the most wonderful lunch that I can recall from that unreal decade called the 90s. So that, my friends, concludes yet another Ballanger anecdote from the 1990s, which constitutes why April Fools' Day triggers such very warm memories. In keeping with the spirit of the day, many of us have been made to appear as fools by the shenanigans brought to bear upon us by the bullion bank traders. 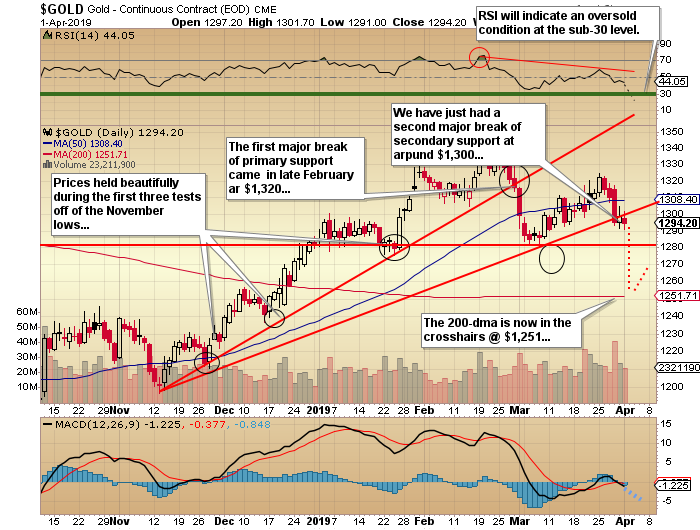 The most recent example was the "false breakout" in Barrick (GOLD:US) representing a textbook case of suckering the public by way of that beautifully painted tape last week. Now, as to gold bullion, I can usually offer some flashes of self-imagined brilliance that attempt to advance the well-crafted illusion that I am somewhat smarter or more clairvoyant than the average investor, but when the cycle puts me to the point of "ZERO KARMA" (where I have ZERO vibes kicking in), I have to back-pedal to neutral and take down position sizes. That is where I am now. I feel like it is a "No Man's Land" in both technical and fundamental terms, at least in the very short term with a distinct bias to the downside. The major indicators I use (shown above) are indicating to me that there is no thunderous signal dominating the metals right now. The Daily Sentiment Index in the 60s is far from a bottom; past bottoms have seen the DSI under 15. RSI at 44 is well off the high recorded on Feb 20 at 72 and the MACD/Histogram combo is around the zero mark but trending lower. Silver is acting horribly, as I mentioned last week, as well. We are also in the seasonally soft period that lasts until mid-May and possibly into June, so only event risk carries the potential to jolt the gold buyers to action. Lastly, the booming stock market rally off the Christmas Eve lows shows no signs whatsoever of abating with its dominance sucking the oxygen right out of gold's breathing space. All these factors in unison are suggesting that temperance is required before leaping into any aggressive products such as the options or leveraged ETFs (NUGT or JNUG). That does not exclude scalp trades but you have to be exceedingly nimble if opting to take that route. 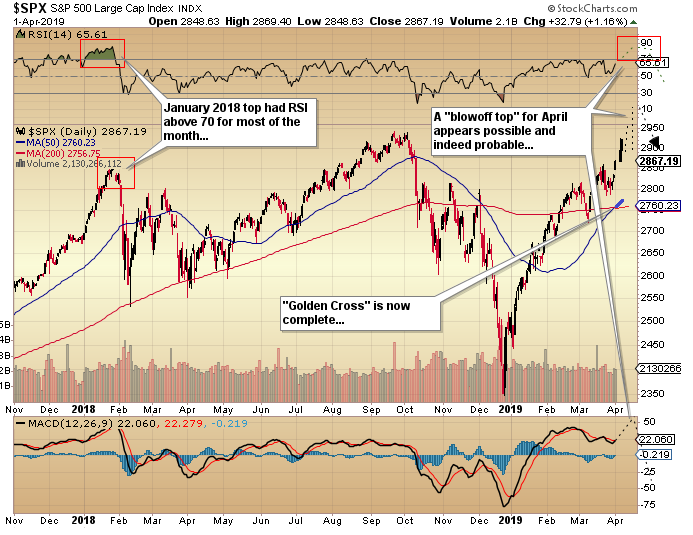 In the month of March, if I were a betting man, I would have plunked down a few Borden's on the likelihood of a stall-out in the S&P at 2,850–2,860 to coincide with Dow 26,000. My thinking was that as overbought as the market "felt," it really wasn't terribly so, as you can see from the above charts. 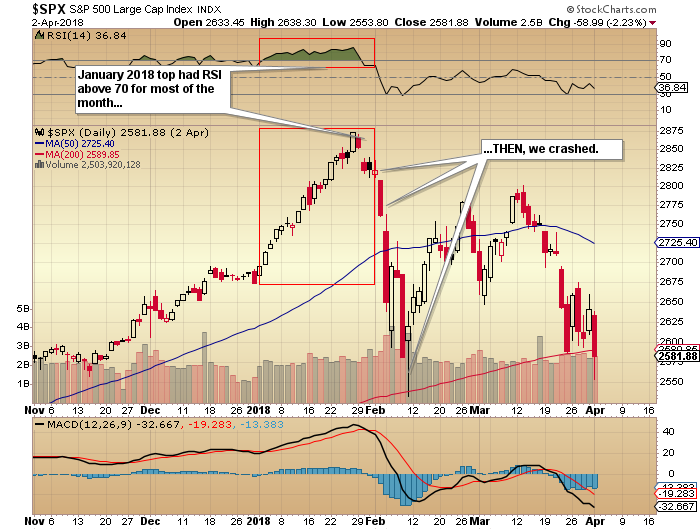 By comparison, January 2018 had RSI in the 70s for most of the month before topping out in an exhaustion gap followed by the teeth-jarring February rout. Monday's big pop in the S&P and the Dow did not follow through on Tuesday but after 40 years trading markets, I always look to Tuesdays as "countertrend days" when the prevailing bias pauses. At around 8:15 p.m. on Tuesday evening, there was a news bulletin that the algobots jumped on sending the S&P futures northward and here on Wednesday morning pre-opening, they are up over 11 points. 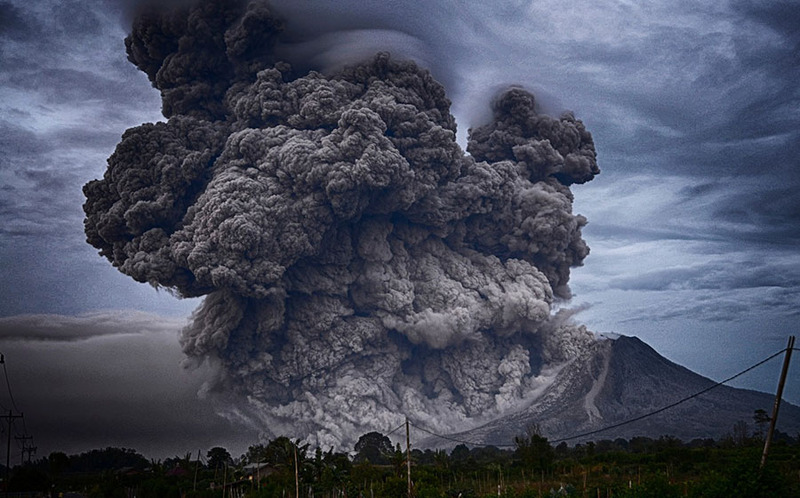 This is not bear market action; it is early stage BULL market action where every dip is absorbed by maniacal buyers and in the growing absence of fearful sellers. Furthermore, just to annoy the Conspiracy Theory advocates of Stock Market Manipulation, it simply doesn't MATTER whether the "Plunge Protection Team" or the NY Fed or the Bank of Japan are doing the propping; at the end of the month your P&L and your loan officer won't give a hoot about that.